newer facility, spa available same floor as room, large bath tub - after sleeping - mattress needs to be replaced - not comfortable - noisy as it strains and creaks with any movement - I found an extension cord - but prior to that - no where to plug in my laptop. Overall quiet, private, sunlight in room, and has a refrigerator. Maybe add a comfortable chair to the seating for the room. Clean, quiet and good location between San Simeon and Cambria. I would stay there again. Very affordable. 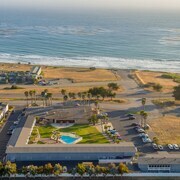 Where to find San Simeon hotels near an airport? Where can I find hotels in San Simeon that are near tourist attractions? When it's time to start planning your Central California escape, you can relax because you'll find an extensive selection of great accommodation options in San Simeon. Expedia has at least 30 hotels within 0.1 kilometres (0.06 miles) of central San Simeon. Visitors wishing to base themselves centrally in San Simeon, should check out the latest deals at the Best Western Plus Cavalier Oceanfront Resort and The Morgan Hotel San Simeon. 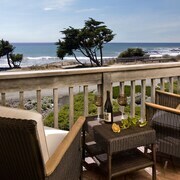 Cambria is an area that is 12 kilometres (7 miles) from the main part of San Simeon and has 19 places to base yourself. 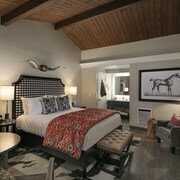 Hotel options here include the El Colibri Hotel & Spa and Pelican Inn & Suites. The San Simeon State Park and the Nitt Witt Ridge also have hotels nearby. 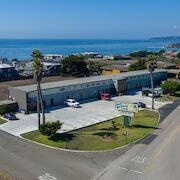 The FogCatcher Inn and the Cambria Landing Inn & Suites are near the San Simeon State Park and the The Rigdon House and Fireside Inn on Moonstone Beach are near the Nitt Witt Ridge. Thrifty travelers rejoice! San Simeon offers a fine selection of keenly priced hotels. 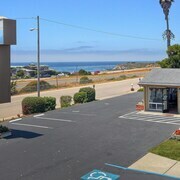 The Sea Breeze Inn is 0.3 kilometres (0.2 miles) from the main part of San Simeon, while the Cambria Palms Motel is 8 kilometres (5 miles) away. Other options in the budget range of San Simeon are the Sands by The Sea and the Days Inn San Simeon. You could investigate the On The Beach Bed & Breakfast and the Cambria Pines Lodge. The On The Beach Bed & Breakfast can be found 30 kilometres (18 miles) from downtown San Simeon. The Cambria Pines Lodge, is situated 8 kilometres (5 miles) away. 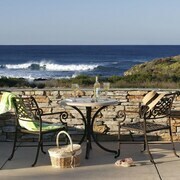 The Sea Otter Inn and also the Olallieberry Inn B&B are two other recommended accommodation options around San Simeon. The greater Central California area is definitely worth visiting as well. Central California is marked by valleys and rolling hills. Commonly visited Central California tourist destinations include lighthouses. In this region of United States of America visitors may also enjoy snowboarding and skiing. 55 kilometres (36 miles) to the southeast of San Simeon you will find San Luis Obispo, home to the Mission San Luis Obispo de Tolosa and Cuesta College. Some of our recommended San Luis Obispo hotels and accommodations are the Madonna Inn and Granada Hotel & Bistro. Alternatively, you could stay in Baywood Park, 45 kilometres (27 miles) to the southeast of San Simeon, where you can pick from the 456 Embarcadero Inn & Suites and Beach Bungalow Inn and Suites. The Morro Coast Audubon Society Sweet Springs Nature Preserve and Elfin Forest Preserve are a couple of the more popular points of interest to see when visiting Baywood Park. San Luis Obispo County Regional Airport is a practical airport, and is located 60 kilometres (38 miles) from San Simeon. Expedia-listed hotels close to San Luis Obispo County Regional Airport are Courtyard by Marriott San Luis Obispo and Embassy Suites by Hilton San Luis Obispo. What are the most popular San Simeon hotels? Are there hotels in other cities near San Simeon? 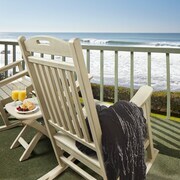 What other types of accommodations are available in San Simeon? Explore San Simeon with Expedia.ca’s Travel Guides to find the best flights, cars, holiday packages and more!